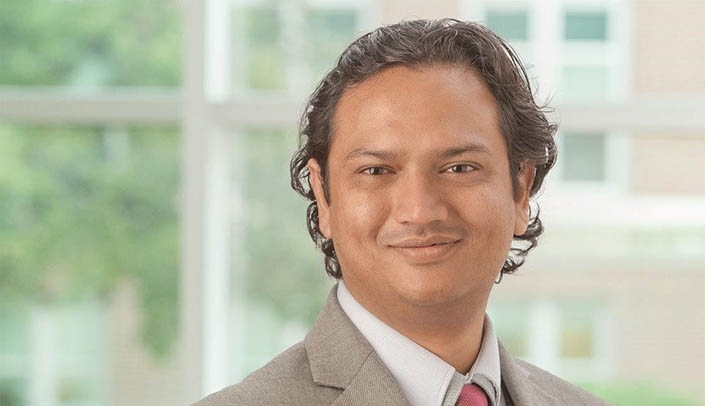 Danish Bhatti, M.D., is one of the recipients of an Office of Academic Affairs 2018-19 Impact in Education Award. He will receive the Innovative Practices in Education Award. This award recognizes an individual who demonstrates ingenuity, courage and creativity in teaching including innovations in use of educational technology, experiential learning, adoption of simulation and creative use of the classroom, as well as an engaging presentation style. Joined UNMC: 2009 (as resident) and stayed on as faculty after fellowship. You are the recipient of the Innovative Practices in Education Award. How has innovation played a part in your teaching career? Innovation has allowed me to reach out long distances without being limited by physical classrooms. I found the online education tools allow me to offer material at self-pace for various learners and at self-selected times. This is very valuable for adult learners, especially residents, who need flexibility of timing. This also proves highly valuable when teaching across the world internationally, given differences in time zone, and allows the formation of a community of learning with students from various places. This allowed me to run a successful online movement disorders mini-fellowship in Pakistan, with participants even from Afghanistan, Saudi Arabia and United Arab Emirates. Another strength of online education is the ability to assess and monitor the progress and engagement of the learners and provide formative feedback to enhance, correct and guide learning. Online tools allow us to offer curated content to learners and follow their engagement and progress. This feedback is useful with local learners but imperative to teach at long distances and internationally. UNMC provided me with indispensable tools and education to be able to deliver these programs within our neurology residency and internationally. Describe your proudest moment as an educator. My proudest moment was receiving the International Best Teacher Award for my work in Pakistan from the Pakistan Society of Neurology within three years of my work with them. That made me happy, knowing that I have made an impact on neurologists in the country and would impact thousands of patient lives. This makes medical education so satisfying. What advice would you give other faculty members who want to have an impact in education? Everyone is already doing great teaching. I have personally thoroughly enjoyed and benefited from faculty at UNMC as a resident. What may enhance outcomes for the learners is more feedback, more from faculty to the learners and more from learners to the faculty. This ongoing formative feedback is very useful in guiding the learner and the teacher and is much better than a summative assessment. Online tools don't replace the learning experience, only enhance it. Do you have a favorite quote or philosophy on teaching? Congratulations Dr Danish Bhatti, you’re pride of the whole nation. Very well deserved indeed. JazakAllah khair for being a true inspiration young neurologists. Congratulations, Dr. Bhatti! Your passions for education and innovation shine not only within Neurological Sciences, but the entire University! Congratulations, Dr. Bhatti!! This is amazing!!! How lucky we are to have you here at UNMC!